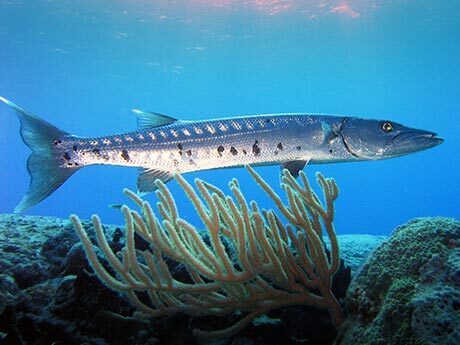 The Great barracuda is amongst the top predators in their environment and use very highly developed smell and vision senses to locate their prey. 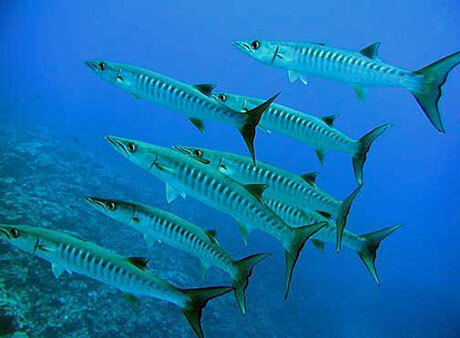 When attacking, the barracuda will charge at fast speed (approximately 12 ms-1) and ram their target. They then unleash the power of their jaws which allows them to slice through their prey, even those larger than the barracuda itself. 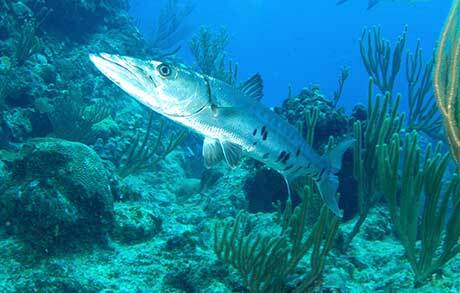 The jaw of the barracuda is formed in such a way that the upper and lower jaws form ‘rows’ of teeth. The top jaw has smaller serrated teeth on the outside and larger canines on the inside, and the teeth of the lower jaw fit between them when the mouth is shut. When the jaw closes this acts like scissors and slices through prey with ease.